Kei Miller was born in Jamaica in 1978. Kei writes across a range of genres: novels, books of short stories, essays and poetry. His poetry has been shortlisted for awards such as the Jonathan Llewelyn Ryhs Prize, the Dylan Thomas Prize and the Scottish Book of the Year. His fiction has been shortlisted for the Phyllis Wheatley Prize, the Commonwealth Writers Prize for Best First book and has won the Una Marson Prize. His recent book of essays won the 2014 Bocas Prize for Caribbean Literature (non-fiction). In 2010, the Institute of Jamaica awarded him the Silver Musgrave medal for his contributions to Literature. Kei has an MA in Creative Writing from Manchester Metropolitan University and a PhD in English Literature from the University of Glasgow. In 2013 the Caribbean Rhodes Trust named him the Rex Nettleford Fellow in Cultural Studies. His 2014 collection, The Cartographer Tries to Map a Way to Zion, won the Forward Prize for Best Collection. Author photo © Christine Fourie. 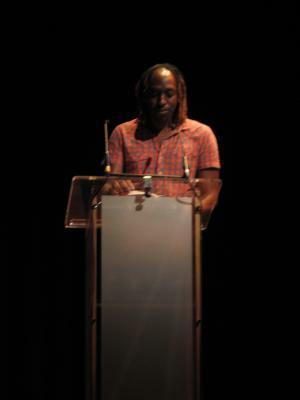 Kei Miller has a page on the Poetry Archive website, where you can listen to recordings of his poetry and access other useful resources. Click here.